“Never the Same” tells the author’s story of healing and finding the light once again after a great loss. This book is one way of telling people that in pain, uncertainty, and despair, there is hope for true healing and comfort in knowing that each one should not go through it alone. The path to healing is difficult but with hope and faith, it’s possible. The journey towards healing was difficult for Dr. Bill McEntire. However, it was not impossible. More importantly, he was not alone. With the relentless support of his family and the strength of his faith, he found hope. Losing beloved wife truly left him in sorrow and pain but he realizes that life should go on. Now, he shares his inspiring path to healing with his book. Dedicated in memory of his loving wife, “Never the Same” is meant to inspire and help others who have suffered a great loss. He narrates how he found his strength from deep within and started his journey to healing. He shares how he struggled with the pain and uncertainty and how his supportive family and the community of faith helped him through his journey. He tells conversations during his path to healing that will inspire and change people’s lives and give them a different perspective. Most of all, he emphasizes how his faith in God played a big role to find the light of hope again. 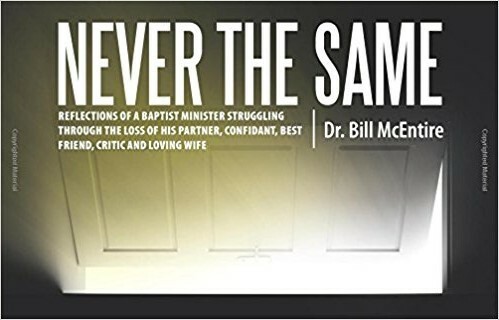 Learn about Dr. Bill McEntire’s journey towards healing through his book “Never the Same.” Purchase paperback copies are available on Amazon through this link: https://www.amazon.com/NeverSameBillMcEntire/dp/1512775088. Dr. Bill McEntire was born in Rutherford County, North Carolina in 1960. At the age of sixteen, he accepted Jesus as Savior and entered Christian service. He later enrolled at Gardner-Webb College in Boiling Springs and finished in 1983 with a Bachelors of Arts in Religion. He enrolled in Southeastern Baptist Theological Seminary at Wake Forest, North Carolina. While there he received a Master of Divinity in 1987. He attended and received a Doctor of Ministry degree from Gardner-Webb University in 2010 and specialized in ministry with the single parent families. He has a passion to tell others about Jesus Christ and promote the children’s shoebox ministry through Samaritan’s Purse. His desire is that these thoughts and struggles will help someone whether it be a minister or layperson who may be thrust into the lonely life after the death of a loving family member. Life truly is never the same.